We didn’t climb a beanstalk but we did meet a giant—and I met a snake | Where to next? After my recent post on some of our gastronomic delights in India, a faithful follower has asked me to avoid food posts in favour of posts on animals and people. Seems she overdid comfort eating (ice cream) to compensate for her lack of India food at home. 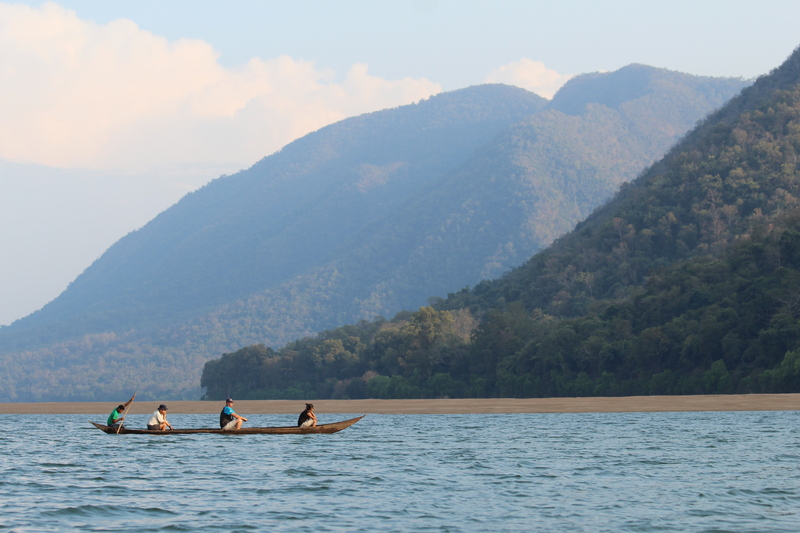 I didn’t actually agree to her request, but let’s take a side trip anyway to Satkosia Gorge Wildlife Sanctuary on the Mahanadi River in the eastern state of Orissa. It’s probably fitting because we were on our way to the gorge when we stopped in Angul for those remarkable paneer rolls I described in my ‘offending’ last post. 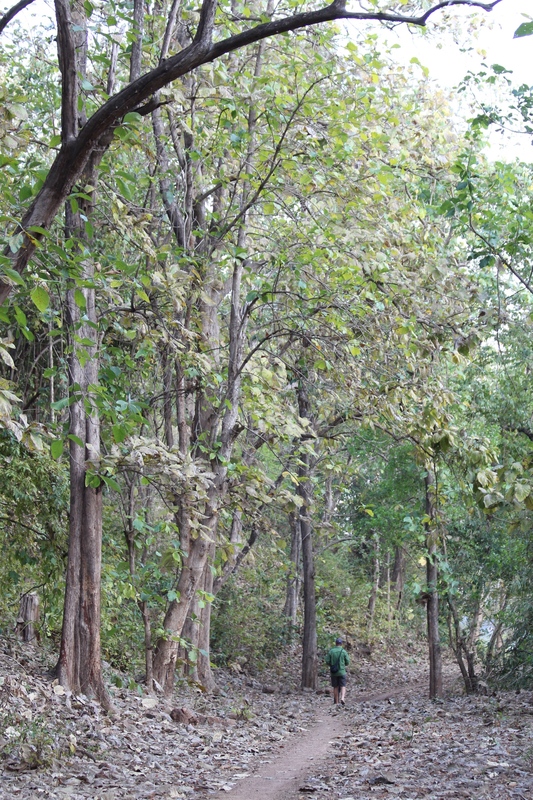 This sanctuary and the Baisipalli Wildlife Sanctuary make up the Satkosia Tiger Reserve. If the brochure is to be believed, the reserve is home to a ‘significant’ population of tigers. It also boasts leopards, elephants, spotted and barking deer, sambar, bison, wild dogs, sloth bears, jackals and porcupines. We didn’t see any of them, which is not surprising when you read on to find that the 1000-square-kilometre reserve has 17 tigers. This is when you have to remind yourself that the national parks and reserves of India are NOT zoos. There’s never any guarantee that you will see anything. 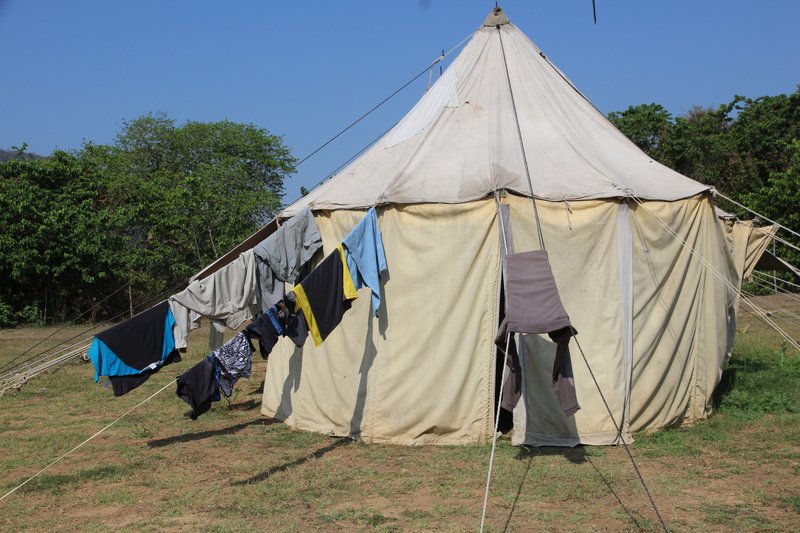 So we did laundry instead—lots of it. Tikarpada village, where we stayed, had plenty buckets, plenty of water and plenty of sunny weather. After ‘household duties’, we went for an afternoon canoe ride on the river. 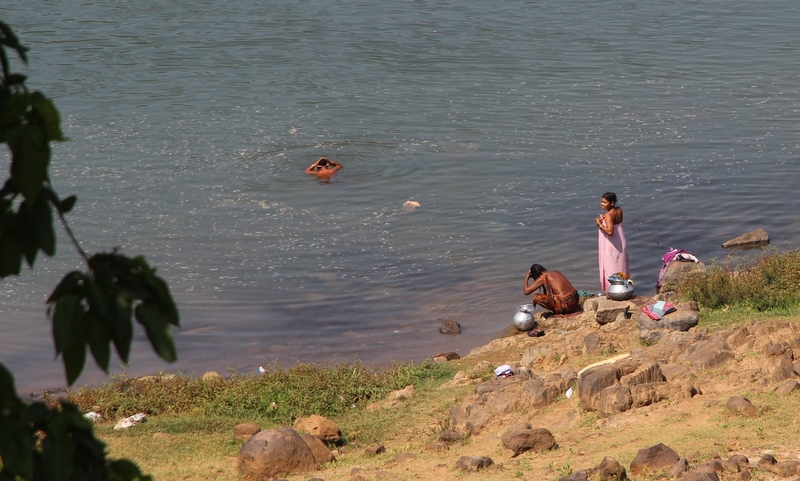 We scrambled down the hill (Tikarpada sits on a cliff now) and across the laundry-laden rock field to the riverbank. Then it was into the canoes—Poor John, Gary and Deepti in the first one, and Anand and me in the second. As we ‘stepped’ into these wooden crafts, we threw all thoughts of occupational health and safety overboard. The river was running fast, we’d be sitting a few centimetres above it, there were no lifejackets, the canoes were leaking and the cheerful polers/paddlers were baling as needed. But the cruise was peaceful with not much happening. A few birds were around and some fishing boats and baskets were ‘parked’ on shore. Our poler explained that in the prawn (shrimp) season, which is now, traps are set during the day and collected at night. He catches 200 grams to 5 kilos of prawns a night, and sells them to a middleman for about 250 rupees (A$5) a kilo. I now forget the amounts he quoted for fish, but the catch weight was higher and sale price was lower. In the midst of all this chatter, there it was—THE GIANT! Our poler spotted it first. Of course, I’d never seen such a giant before, and with the exception of our two polers, no one else had either. This was momentous. Anand and Deepti, both accomplished naturalists in India, were as excited as I’ve ever seen them. But because we were facing the setting sun, the giant appeared as a silhouette. So our polers took us farther along until we could get a better look. And then before long we saw a second giant, in an even better light. We all danced around with joy—in our heads and not in the canoe—at this multiple sighting of a new species for us, and after a long look headed back to ‘port’. I’m talking about the Indian or Malabar giant squirrel—the largest tree squirrel in the world and one of the most beautiful. Eastern grey squirrels are about 10 inches long (head and body), while the adult Indian giant is 16 inches long, plus a tail that is almost another 2 feet. The long tail acts as a balance and a rudder, allowing the squirrel to leap almost 20 feet at a time. And they’re colourful. 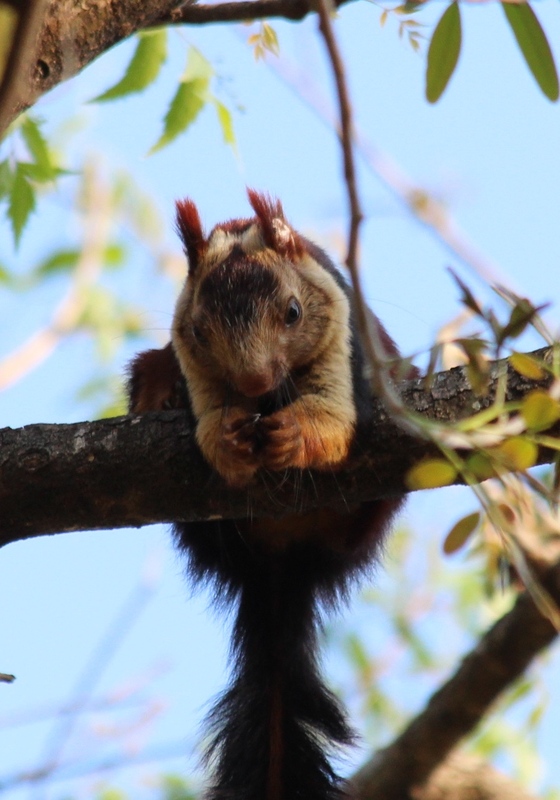 Indian giant squirrels are two-tone and sometimes three, with colours of creamy beige, buff, tan, rust, brown and dark seal brown. The colour schemes tend to be region-specific, so if you manage to see the squirrel up close, you can usually tell where it comes from. 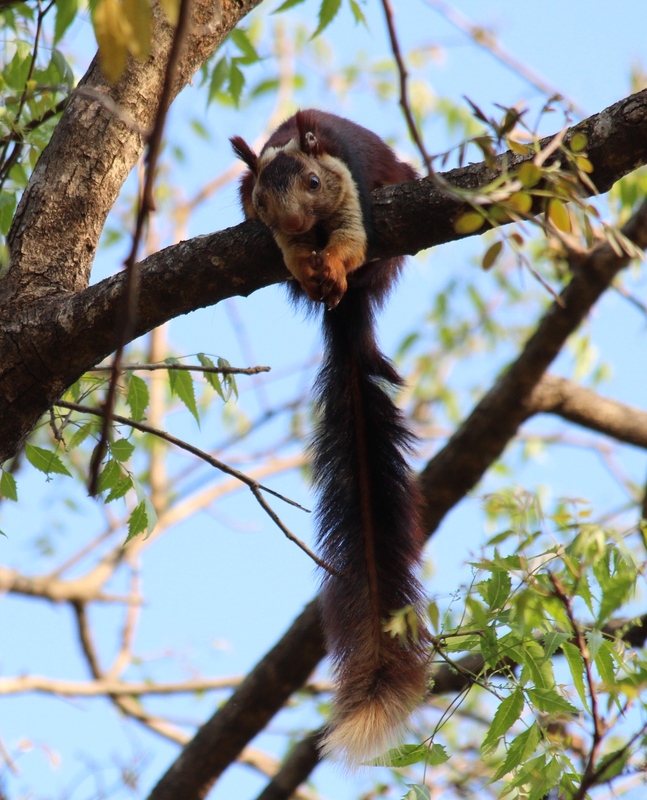 Indian giant squirrels are quite shy and dwell in the upper canopy of the forest. They almost never leave the treetops. No wonder it was such a challenge to get good pictures of them. The next day we set out on a stroll through Tikarpada village and then up the gorge. Overnight we were told that the village is at the far end of the gorge and that our canoe trip had been away from the gorge. 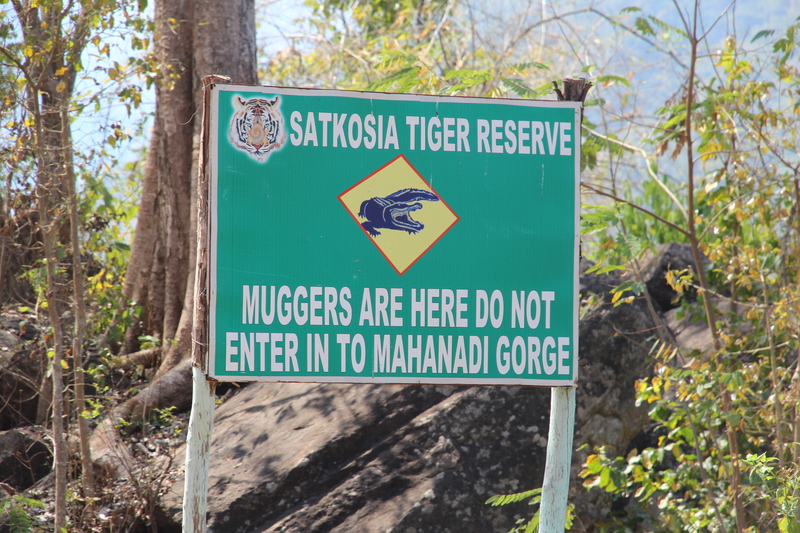 Apparently people aren’t really allowed into the gorge and the proper part of the tiger reserve. Geez, how hard do they need to make it for you to see the wildlife that they promote? But you smile—and grit your teeth—and press on. Luckily this outing proved to be more productive. For starters, we got a good look at the village. Tikarpada is the proverbial moveable feast. 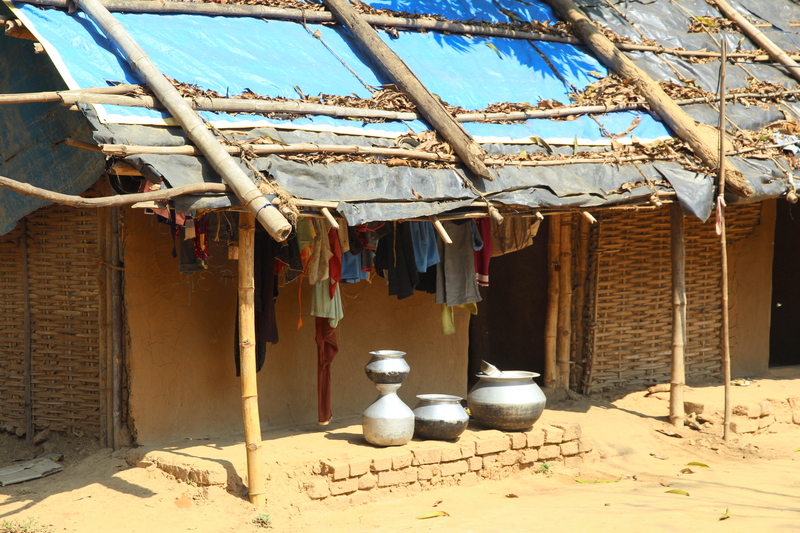 While a few structures look fairly permanent, the river’s high monsoonal flow means the village sometimes has to move a bit after the water subsides. Recently they had to move a lot—away from the shore, gorge and reserve. Why? Because the government decided hey were encroaching on the wildlife. Beats me how a long-time village that the government promotes as one of the places to stay among the wildlife has now become a problem? But complaining aside, the walk was rewarding. After the village, we came upon the gharial breeding and research centre. I’ve already introduced this endangered crocodile, and this gave us a chance to see them close up. Gharial breeding in Satkosia is having mixed results. There are several (maybe three) adult gharials in the river, possibly all males. Well, that’s not going to produce any offspring. The centre says it collects eggs, hatches them and releases the gharials into the river. They also breed mugger crocodiles. Anyway, admission was a whopping 10 cents a person and allowed us to walk unescorted through the centre and out the other side, which was padlocked but we slipped through the gaps between the gate and the fence posts. Quite sensibly, we paid attention to the sign that said don’t go in the water because of crocodiles. And ignored the sign that said something like Satkosia Tiger Reserve, keep out. It didn’t take long for the forest to present us with more to look at, including quite a few giant squirrels. And they were in lower branches so easier to photograph. 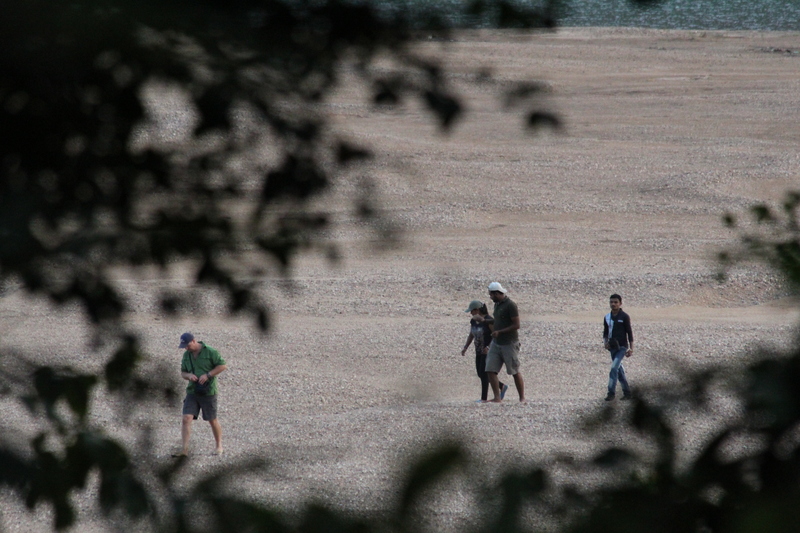 After a bit, Anand, Deepti, Gary and Poor John decided to walk on to where Tikarpada used to have its tents on the shore. I’d had enough of scrambling down hills so opted to wait for them. We’d already been walking for a couple of hours so I found a flat rock to sit on, while I scrolled through photos on the camera. Not sure why I happened to look down when I did. A baby snake had slithered across my thong (flip flop) which I’d slipped off earlier, and was thinking about crawling up the inside of my shorts. I didn’t scream, I didn’t shout, I didn’t even jump. Instead, I ever so slowly stood up and backed away. Hello my little friend, and just who are you? No answer, just a curious look and then it slid away through the leaves and down the embankment. It seemed like ages before the others returned and I could tell them about this close encounter. But the question of who it was remains unanswered. So far, no one has been able to identify what kind of snake it was. Can you? Can anyone identify this snake? Please! Peggy, lovely as always. The snake would have made me jump. The “Sandy Shore” is this a lake? Looks like a wonderful place to walk. Thanks Jeanette. I think I was too startled to jump. Go figure. The sandy shore is on the river’s edge. That was fast. Thanks so much. 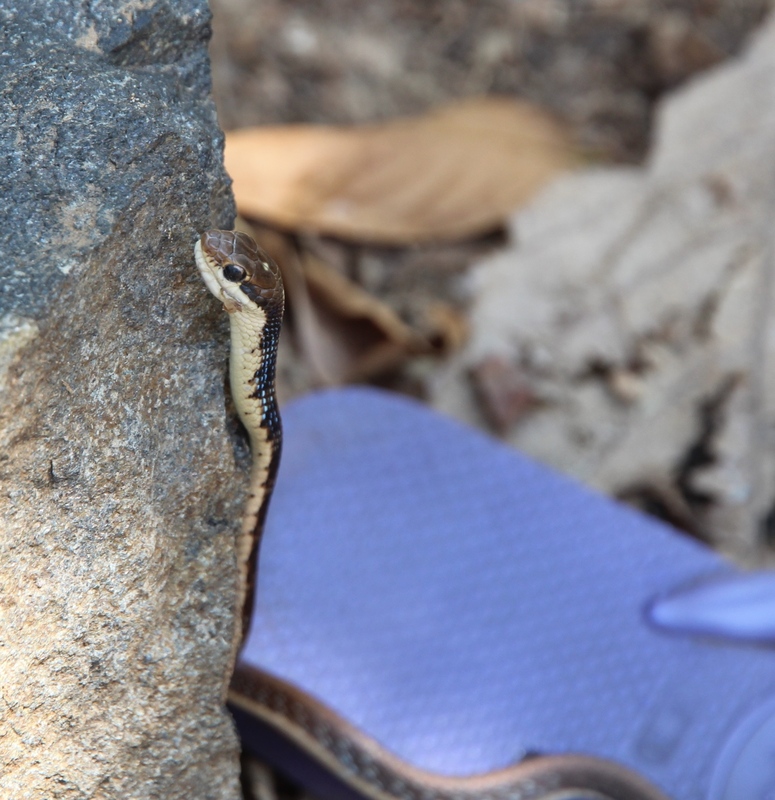 By checking photos, I think it is a common bronzeback tree snake. The white spot on the head helps with identification. Thanks again. Such fun to read! I always enjoy sharing travel adventures. I want you to bring back a giant squirrel. I will look after him. Wonderful! As always you write in such a way that I feel I am there too! Thanks Lesley. I love the company. You are such a GOOD friend – no food pictures. I didn’t gain a single pound reading your post. I have thrown away all my flip flops and will never sit on a rock again, much less in India. P.S. The squirrels and Gharial were pretty cute. Aw, come on. It was a teeny, tiny, itty, bitty snake. It wasn’t even as big around as my little finger. And I’m sure he smiled at me. Teeny, tiny, itty bitty snakes have mothers. You always make me laugh. Thanks. How incredibly exciting to see that giant squirrel thing! I would have been thrilled! My blog seems so tame compared to your adventures in crazy locations. Most entertaining. 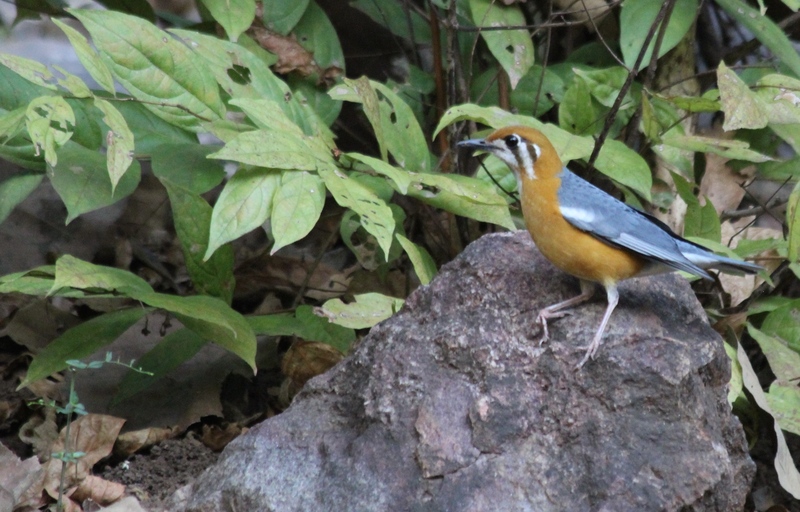 I am learning about new wildlife and culture from each of your blog posts. Your hikes and accompanying pictures are wonderful Jane. Keep ’em coming. The giant squirrel is a cutie! I enjoyed your photos of him! The snake was the very tiny kind. He almost looked friendly. Yep, up the shorts would have had me up the tree with the squirrel. The giant squirrel is really cool. The snake- not so much. Honestly, the snake was cute too. Looking for something to post to you besides great post? But, they are just that and they get better every time you do post my friend!! Loved the snake excitement too. I’m going to be very depressed when you leave India I fear! Don’t fret Mike. I’m so far behind on stories about India, it will take months to tell all the tales. No clues on the snakes and last time I posted a pic of a snake we saw in the Southwest, no one stepped forward with an ID. I guess my blog just isn’t popular with the snake loving crowd. 🙂 The squirrel sure is neat though! 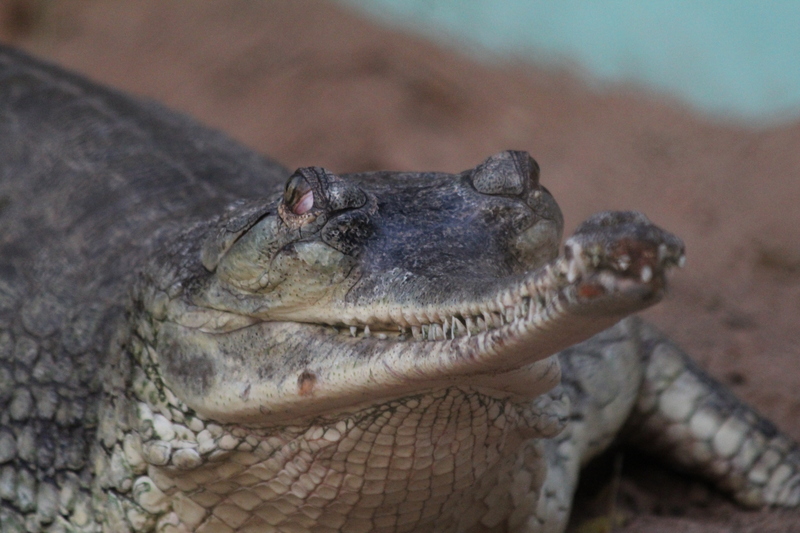 And the gharial – amazing. Very true, lots of cute things can be dangerous.